"Building confidence in and out of the pocket." 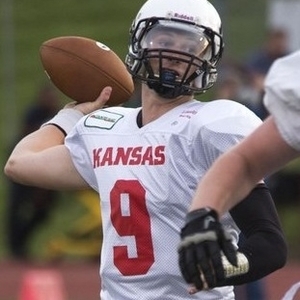 Spin It Quarterback Academy is Kansas City's premier quarterback training program. Spin It's philosophy is to provide year-round, first-class instruction to help each player reach his potential. Each quarterback will receive an in-depth evaluation that will be used to design an individual training program. We know that playing quarterback is the toughest position in sports. Because of that it's our goal to teach each player to practice at game speed, mentally challenge themselves with every throw and develop a work ethic that will improve their skills with each workout. A typical session will include instruction on throwing mechanics, footwork, pocket awareness, defensive recognition, film study and leadership skills that will help them on and off the field. If interested in learning more, contact Justin Hoover at kcqbcamp@gmail.com or 816-807-8174.